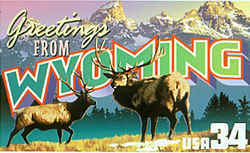 Wyoming gained statehood in 1890, and waited for its second Legislature to approve an official seal three years later. The Great Seal of the State of Wyoming was adopted by the second legislature in 1893, and revised by the sixteenth legislature in 1921. 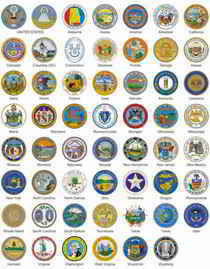 The Secretary of State is the Custodian of the Great Seal. The signature of the Governor, the certifying signature of the Secretary of State and the impression of the Great Seal represent the authority and sovereignty of the State of Wyoming. The state seal is displayed in stained glass in the ceilings of both the Wyoming's House of Representatives Chamber and the Wyoming Senate Chamber in the state capital. The seal is also incorporated into the design of the state flag, which prominently features the seal set against the silhouette of an American Bison. The two dates on the Great Seal, 1869 and 1890, commemorate the organization of the Territorial government and Wyoming's admission into the Union. The woman in the center holds a banner proclaiming "Equal Rights," Wyoming having been the first government to grant equal civil and political rights to women. The male figures typify the livestock and mining industries of the state. Upon a five-pointed star the number "44" appears, being the number of admission into the Union. On top of the pillars rest lamps from which burn the Light of Knowledge. Scrolls encircling the two pillars bear the words "Oil," "Mines,""Livestock" and "Grain, "four of Wyoming's major industries. 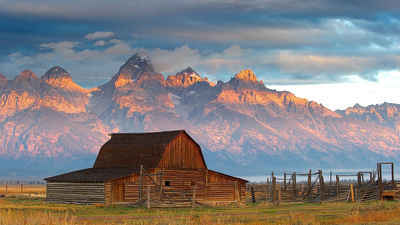 Wyoming Statutes, Title 8, Chapter 3, Section 8-3-101. 8-3-101. Great seal of the state of Wyoming. 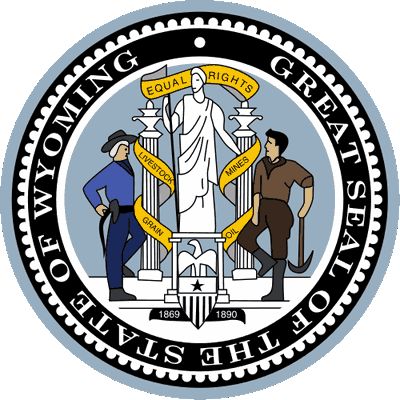 There shall be a great seal of the state of Wyoming, which shall be of the following design, viz: A circle one and one-half (1 1/2) inches in diameter, on the outer edge or rim of which shall be engraved the words "Great Seal of the State of Wyoming." 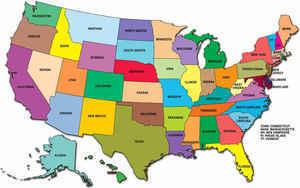 The design shall conform substantially to the following description: A pedestal, showing on the front thereof an eagle resting upon a shield, the shield to have engraved thereon a star and the figures, "44," being the number of Wyoming in the order of admission to statehood. Standing upon the pedestal shall be a draped figure of a woman, modeled after the statue of the "Victory of the Louvre," from whose wrists shall hang links of a broken chain, and holding in her right hand a staff from the top of which shall float a banner with the words "Equal Rights" thereon, all suggesting the political position of woman in this state. On either side of the pedestal and standing at the base thereof, shall be male figures typifying the livestock and mining industries of Wyoming. Behind the pedestal, and in the background, shall be two (2) pillars, each supporting a lighted lamp, signifying the light of knowledge. Around each pillar shall be a scroll with the following words thereon: On the right of the central figure the words "Livestock" and "Grain," and on the left the words "Mines" and "Oil." At the base of the pedestal, and in front, shall appear the figures "1869-1890," the former date signifying the organization of the territory of Wyoming and the latter the date of its admission to statehood.